Many stories abound to where the Sweet William flower name comes from Whether it is named after Prince William the Duke of Cumberland, Saint Williams of York, or William the Conqueror. I am not sure of this but I do know that my brother in law was named after this beautiful flower as my mother in law loved it so. 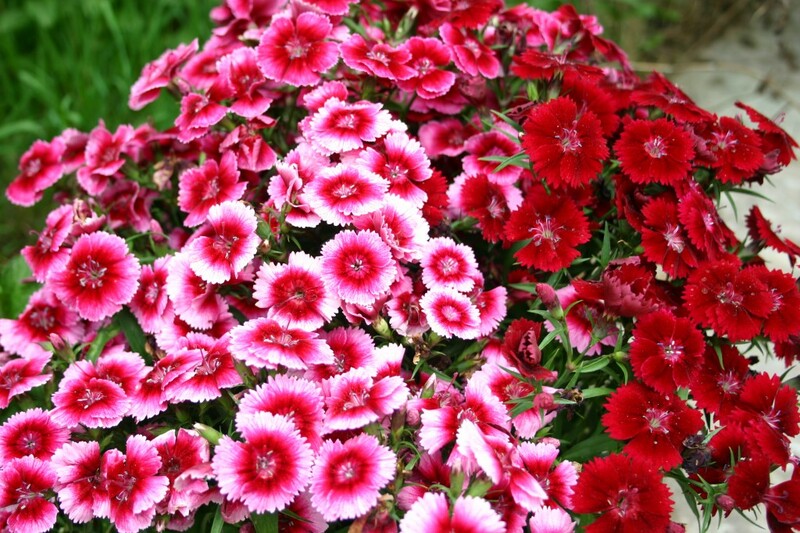 She always grew it in her garden and enjoyed it daily just as she refereed to her son as Sweet William. Sweet William is a biennial color flower. A biennial plant grows for two years and blooms in the second year. 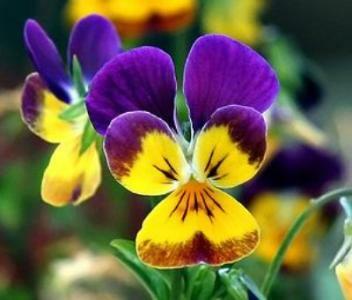 The flower is native to Europe and can be grown all over the U.S. There are several varieties of Sweet Williams in both perennials and biennials. Plants will grow from 7 to 18 inches tall and grow in clusters ( to me resembling bouquets) in gardens. Colors of white, red, pink, crimson, scarlet, purple and bi-colors are available. The plant stays small and grows between 12 inches to 24 inches. The small size of Sweet Williams makes them great for containers and pots. Grow them in pots in window baskets or vertical planters. These small plants look beautiful in front of flower gardens. When they are in bloom the small size makes beautiful cut flowers and look awesome in vases. 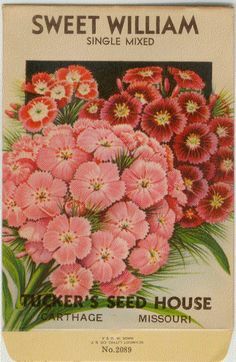 Sweet William grow from seeds. It is easy to directly place the seeds into your flower garden or seed them indoors to transplant at a later date. To achieve spring blooms start the seeds inside between 6 to 8 weeks before the last frost ( in our area it is time to seed now) Transplant the seeded plants directly into the flower bed after the last frost date. Plant six inches apart they will tolerate a bit of crowding. Use them to fill in a flowerbed or as a border edge. 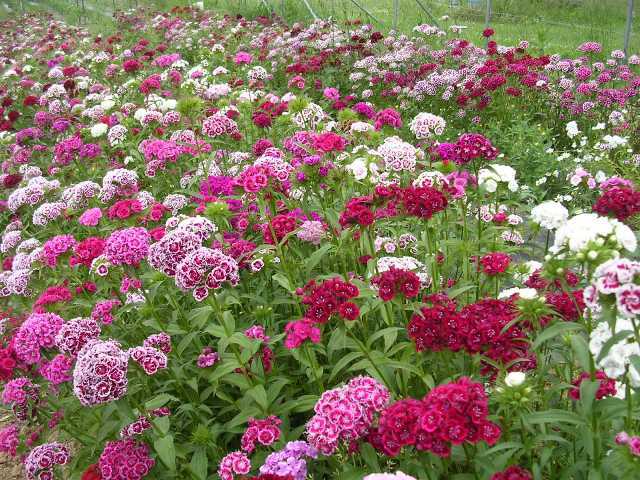 Sweet Williams should be grown in full sun. Rich, loose soil that drains well is the best. Use a general fertilizer to plant and then repeat that once a month. Plant grows quite well if needed during dry times water once to twice a week. Happy Birthday Levi Strauss. The fashion of blue jeans was helped out by this strong fashion man. By making one of the world's most durable and popular clothing item that in a pair of blue jeans. The clothing line came on as part of early America. Strauss was born in Germany and later came to America at the age of 18. He started out life in America working for his brothers dry good business. When Levi Strauss was in his 20's he traveled out west to start up his own dry goods store. It was here that he started making heavy work pants. These work pants would become known as jeans in the 1870s. The blue jeans remain a fashion tribute to work in, dress up in and just to be lazy in. when he and partner Jacob Davis partnered together to invent the blue jean in 1873 Davis was a taylor who wrote Strauss for help and together they created blue jeans. Levi lost his own father when just a teenager. Being charitable and thankful for his blessings he made his first donation to the Orphan Assylum Society of the City of San Francisco. These beautiful flowers are Johnny Jump Ups. They look as if they belong in an old fashioned or vintage flower garden. The beauty of these perennials are often grown as annual. They are native to Spain and the Pyrennes Mountains. Johnny Jump Ups are easy to grow. They may also be found growing wild in fields and along the road. The dainty fragrant blooms are grown on small plants. The blooms are a combination of bright yellow and deep purple. They are early spring bloomers. 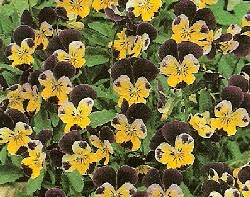 Johnny Jump Ups are perfect for filling in an area of an entire bed. They also grow well in window planters because they are only 7 to 10 inches tall. Johnny Jump Ups are normally grown from seed. Easy enough to plant in full to partial sun. Seed them directly into the garden or seed indoors for easy transport later. Start in pots and containers six to 8 weeks before last frost. So right about now in my neck of the woods would be perfect planting time. After sowing seeds cover with 1/8 of an inch of soil. With a good watering the seeds will germinate slowly and be ready to transplant to garden after the last frost date. Plant 6 inches apart but they will tolerate a bit of crowding. Johnny Jump Ups will start to wilt a bit in mid - summer heat. If you live in a warm area you may want to plant them in a partial shaded area. Fertilize once a month and keep soil moist but not wet. During dry periods water one to two times a week. 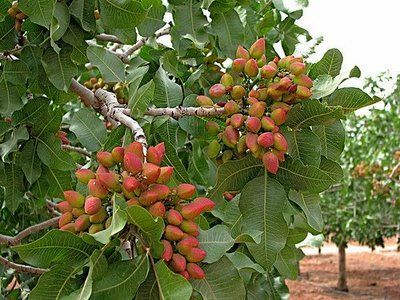 People in the Middle East call it the "smiling nut" and in China its called the "happy nut". All year long in our little area in and around southern Illinois you will find lots of fun entertainment. Often a carnival will be included in all that fun. Every year all around America there are carnivals and millions of Americans who flock to them. With rides, food, entertainment, and the rest carnivals are fun for all. The home town people come home and visit with friends when the carnival and entertainment come to town. Not only are there carnivals that come to town but those put on by the town as well. School carnivals and carnivals put together to honor others are a few examples of great carnivals as well. Today, February 26, is national carnival day. So lets have some fun and think about some of the delicious carnival foods that we can make at home. In a large bowl, combine corn bread mix and brown sugar. Combine eggs and milk; stir into dry ingredients until moistened. 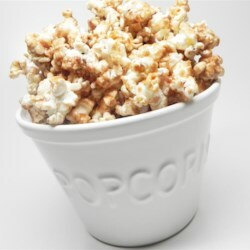 Stir in corn and hot dogs (batter will be thin)Fill greased or paper-lined muffin cups three-fourths full. 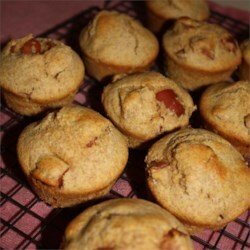 Bake at 400° for 14-18 minutes or until a toothpick inserted in muffin. Serve warm. Refrigerate leftovers. Yield: 1-1/2 dozen. Pour the 2-3 tbsp of white granulated sugar on a plate and set aside. Juice the 4 lemons and set aside. In a small saucepan, add the 1 cup sugar and the 1 cup water. Heat and bring to a simmer till all the sugar has dissolved, turn off heat! This is called "simple syrup"!! I know, the plethora of information I say... but tell me that is not super simple, yes? Now, let's dredge those lemon slices through the reserved sugar and set aside. Using your favorite pitcher Fill 3/4 with ice cubes. 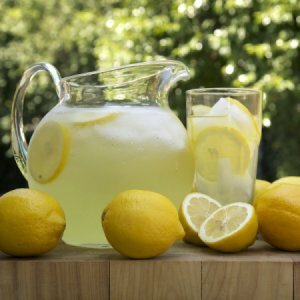 Add your squeezed lemon juice to the pitcher with the ice. Add all of your simple syrup, and stir. Fill with cold water to your desired level. 4 cups cubed white bread, crusts removed first. In a large bowl, add the pork, Italian sausage, prosciutto or pancetta, bread cubes, parsley, oregano, fennel, red pepper flakes, and salt. Use your hands to mix until the ingredients are evenly distributed. Do not over-work.Whisk the beaten eggs and ricotta together in a separate bowl until there are no more large clumps of ricotta. Pour into the bowl of the meat mixture. Mix with your hands until just incorporated. Again, do not over-mix. If you want, to test seasoning, you can take a small bit of the mix, form into a patty, and heat in a small skillet on the stovetop until cooked through. Depending on how this test patty tastes to you, add more herbs, chili, or salt to taste to the meat mixture. Keep meat mixture in refrigerator while doing this. Preheat oven to 425°F. Coat the bottom of a large roasting pan with olive oil. Form meatballs in your hand, about 1 1/2-inches in diameter, using about 3 Tbsp of the mixture to form each meatball. Arrange in pan so there is some space between them. If too crowded they will steam and not brown. Roast meatballs in the oven for about 30 minutes, turning the meatballs after about 20 minutes, until the meatballs are beginning to brown. Remove pan from oven. Use a metal spatula to dislodge meatballs from being stuck to the bottom of the pan. Add the crushed tomatoes to the pan. Carefully cover the pan with aluminum foil (carefully because the pan is still hot!) Return the pan to the oven. Lower the heat to 300°F. Cook for an additional hour to 1 1/2 hours. Makes about 24 meatballs. Top with grated Parmesan. Heat the oil and sautee onion and garlic with a pinch of salt. Once onions are translucent, add sausage and brown. Add to crock pot along with remaining ingredients. Cook on high till plantains and yams are tender to a fork, and soups consistency is thick. Heat butter, cocoa and Dr. Pepper. Mix well and set aside.Cream eggs, sugar and butter, milk and baking soda. Add flour and cinnamon alternately with Dr. Pepper mixture, then vanilla. Pour into greased and floured 9 x 12 inch pan and bake at 350°F for 25 to 30 minutes. Ice with Dr. Pepper Icing. Cream butter and sugar unlit light and fluffy, add extracts. Slowly mix in flour.. 1/2 cup at a time until JUST blended. Meanwhile shape dough into 1" balls and space them about 2" apart on ungreased baking sheets. 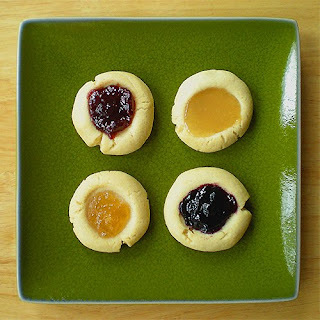 Make deep thumbprints in the center of each ball and fill with preferred jam or filling. Bake for 15 minutes or until cookies are the color of pale sand. Transfer to a wire cooling rack to cool. Once cooled, dust cookies with confectioner's sugar. Preheat the oven to 350 degrees F. Grease an 9x5x3-inch loaf pan. Line the bottom with parchment paper. Grease and flour the pan. Sift together the flour, baking powder, and salt into 1 bowl. In another bowl, whisk together the yogurt, 1 cup sugar, the eggs, orange and tangerine zest, and vanilla. Slowly whisk the dry ingredients into the wet ingredients. With a rubber spatula, fold the vegetable oil into the batter, making sure it's all incorporated. Pour the batter into the prepared pan and bake for about 50 minutes, or until a cake tester placed in the center of the loaf comes out clean. Meanwhile, cook the 1/3 cup orange and tangerine juice and remaining 1/3 cup sugar in a small pan until the sugar dissolves and the mixture is clear. Set aside. When the cake is done, allow it to cool in the pan for 10 minutes. Carefully place on a baking rack over a sheet pan. While the cake is still warm, pour the orange-tangerine sugar mixture over the cake and allow it to soak in. Cool completely then top with glaze (recipe below). In a small bowl, whisk together the confectioners' sugar and milk. The mixture should have the consistency of thin sour cream. Add the melted chocolate and whisk until glaze is smooth. If it is too thin, add more sugar, 1 tbsp at a time; if too thick, add more milk, 1 tsp at a time. Use immediately. If you were here with me you would have seen a mix of percipitaton. Everything from rain, sleet, and snow was seen float down from the clouds today. Not to far away there were places that got more snow than they wanted. It is in these cold weather days that my mother would come up witn a large pan of chili. It is not only our family that loves chili in the cold weather. Others must love it as well as February honors the dish on the fourth Thursday. Chili and Chili Con Carne are both honored. It seems that there may be as many ways to make chili as there are to eat it. Chili comes from Spanish source. 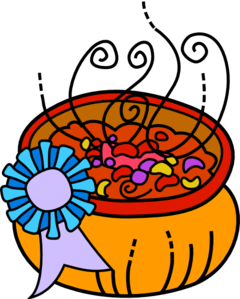 Chili refers to the "chili pepper" and carne means "meat"
The source of the first pot of chili is not known. I would say that it arrived from someone throwing together a few ingredients that they thought would taste great and please the bunch of hungry eaters. My suspicion is that they mixed up some chili peppers with meat and cooked them together. That was the start of the great chili war where a number of recipes would come from. Joe DeFrates (a past winner of the National and the World Chili Championships) reminds us that "chili powder makes one go crazy" The great debate of which chili is better is a war with many battles. The trail of chili and the war can be traced back to the cattle drives Travel through Texas, New Mexico and California will find the battle lines of chili and who's is the best. It has been determined that the mixture of meat, beans, peppers and herbs has been around far back as the Incas, Aztecs and Mayan civilizations. The green chili pepper entered what is now New Mexico around 1600 and still grows there. Islanders from the Canary Islanders brought to San Antonio around 1723 the combination of wild onions, peppers, and spices to create pungent dishes. It was the cattle drivers and trail hands that popularized the dish. The Southwest holds many stories of how the range cooks made chili along the trails of the cattle drive. Collecting wild oregano, chili peppers, wild garlic and onions and mixed it with fresh killed buffalo or beef (if not available they would use jackrabbit, armadillo, rattlesnake or whatever they could get their hand on) There were trail cooks who would plant gardens along the way so that the cowhands would keep filled up with the dishes they would prepare. The Texas town folks would hear the stories of how to prepare the delicious chili and began to want their own. One tail is that Frank and Jesse James would eat a few bowls of the chili before pulling any bank robberies. There are many stories out there that carry the trails of the chili path how it started and the stories that followed. Chili cooks share stories like the fish stories that fishermen have. Chili is made up of tomatoes, beans, chili peppers, meat , garlic, onions, and cumin. As I stated we have no idea where the first bowl was made or served. There are many variations of this delicious dish out there. That is why chili is the perfect dish for cook-offs. 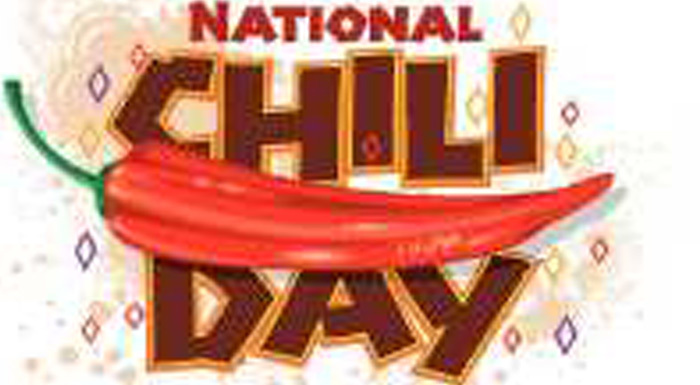 The love of chili arrived early in America and especially in Texas where chili con carne is the states food. 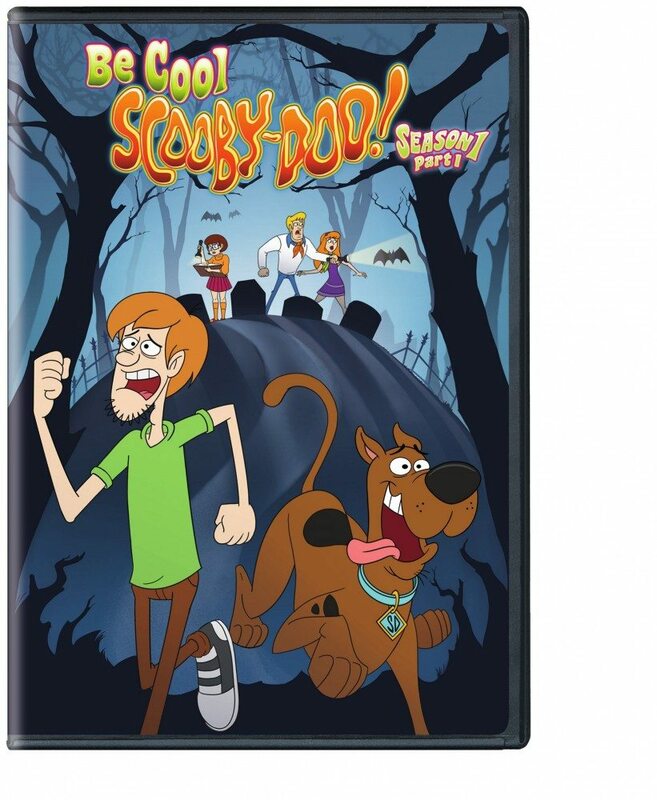 Another great giveaway ending soon and this times it Scooby Dooby Doo. Yes The giveaway is located on the blog Raising 3 Savvy Ladies It ends within 30 hours so if you want in you have to hurry. 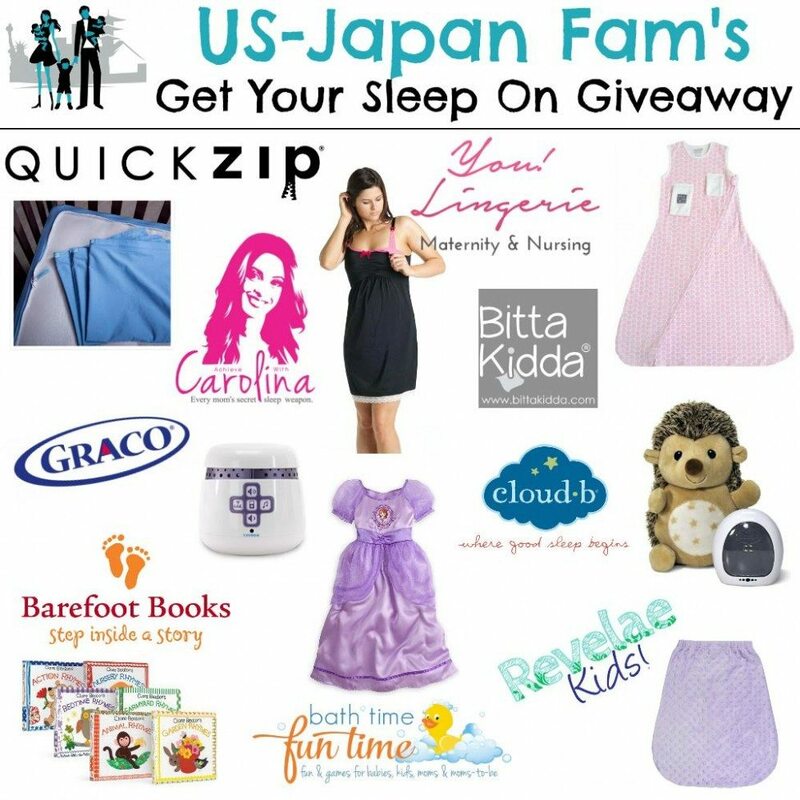 Get Your Sleep On Giveaway ending soon. Check out the great giveaway on the blog Raising 3 Savvy Ladies Over $300 dollars of gifts to help you get your sleep on are up for grabs. This giveaway ends tonight so hurry on over. One thing that my kids and grand kids love to munch on with a bit of crunch is tortilla chips. They are not alone as the tortilla chip is very popular and one of America's favorite munchies. It has not always been that way though, not to long ago Americans seldom ate corn chips and salsa. The corn chip was brought to the U.S. from Mexico. It was Texas business man Elmer Doolin who introduced the chip. February 23 is always a day for the dogs. 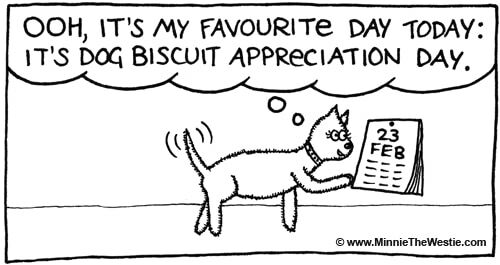 That is because it is international dog biscuit day. There is not another creature that could love a dog biscuit as much as a dog. The problem occcurs when we sit and think about who created this day. While I do not believe there are dogs that can do anything like the Shaggy D.A. I believe it must have been an owner of a much loved dog. How it became international holiday now that is beyond me. Offer your dog some tasty dog biscuits and let your dog have his day today. Your dog most likely will give back to you in return with good behavior or a trick of your choice. Dog biscuits have improved and changed over the years. Dog treats of the past were stale, moldy bread, rotting leftovers and rock hard biscuits made from grain. It was James Spratt from America in the mid 1800s that created the first dog biscuit as we know it today. The treat he created was made up of meat, grains, and veggies. In 1908 the F.H. Bennett Biscuit company of New York developed the first hard baked bone shaped biscuits made up of minerals, cows milk and meat. Dog treats can now help dogs with their breath and teeth. Dog bones of today are safe for your pet and wont make you sick either. Carrots, green beans and broccoli also make great dog treats. Now a treat for you. Everyone in our house loves the delicious treat known as Puppy Chow. 1/2 cup butter, margarine or oleo. In a medium microwave safe bowl, combine butter, peanut butter and chocolate chips. Microwave on high for one minute. Stir mixture. Heat for an additional minute and stir again. Reheat and stir a little more until mixture is smooth. Pour mixture over the cereal. Stir gently until the cereal is well coated. Pour the coated cereal into the powdered sugar. Shake well until cereal is well coated with powdered sugar. Lay out wax paper onto a counter or table. Spread puppy show onto the waxed paper and allow to cool and dry. Store in a covered container or food storage bag until ready to use. Serve in a brand new dog dish. February 23rd is the day to celebrate one of my all time favorite sports. I first watched curling during the winter olympics. I thought it was so cool. Curling is cool day is a day to learn about the sport and maybe even take a chance to play a game or two. The sport began in Scotland in the 1500's. 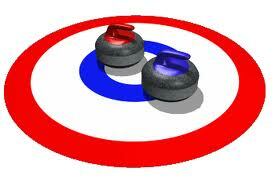 Curling is a team sport where players slide heavy granite stones down a sheet of ice at a circular target area. The curling tournament itself is known as a bonspiel. As I stated I first watched it during the olympics but did not have any idea it has only been an official sport in the winter olympic games since 1998. It was part of the olympic games in 1924.
minutes. Remove from oven place cookies on a wire rack to completely cool. 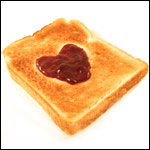 What is your favorite way to make up a piece of toast?? Please share in comments I am looking for great ways to make up a piece of toast and would love your feed back. 1. Wash and hull strawberries. Purée with Cointreau in blender. 2. Heat strawberry purée over a medium heat until bubbling. 3. Add agar agar and stir until dissolved. Place saucepan in a bowl of ice water and allow to cool (but so much it sets). 4. Melt white chocolate and set aside to cool a little. 5. Whip cream until stiff peaks form. 6. Add cooled white chocolate and whip through. 7. When strawberry purée has cooled, whip into cream-chocolate mixture. 8. Divide into serving dishes and refrigerate for a minimum of 3hrs before serving.